We all know the conference stereotype. You sit through a boring lecture pretending to listen while you patiently wait to cash in those conference drinks at the hotel bar. To be fair, most of us have been to such a conference wondering if this was really the best use of our time. We forgive these occasional sleepy conferences for the ones that stand out. As a relatively new professional working for a small institution, conferences are a powerful tool. Conferences allow me to connect with other regional archivists and confirm that I’m keeping up with up-to-date standards. This is when I have the opportunity to bounce ideas around, learn from bigger and smaller (yes, there are smaller institutions) archives, and learn about new resources and recommendations. Occasionally, I’m lucky enough to attend a conference that really stands out above the rest. Like my favourite podcast, The Secret Life of Canada, sometimes you have to give an occasional shout-out to something or someone extra special. I’ll use this platform today to shout-out to the 2019 Canadian-American Archives Conference hosted by the Western Washington University Archives and Records Management Program. This year’s conference theme was Indigenous Issues in the Archives: Representation and Reconciliation. The conference began with Juanita Jefferson, a Lummi elder. Juanita began by discussing the challenges she faced gathering information from other archives about her community. Then we learned about how her and her community have worked to create their own archives. It was a very inspiring presentation and left me with some wonderful ideas on how to improve relations with our institution and the communities that we serve around Chilliwack. Before we broke for lunch, I learned the different perspectives and challenges with indigenous records from the Canadian side and American side. Camille Callison, a member of the Tahltan Nation in Northern BC, examined her experience with the Truth and Reconciliation Commission of Canada (TRC). Importantly, she went on to show examples of specific recommendations that archives and libraries can act on in response to the TRC’s Final Report and Calls to Action. Her presentation was followed by Jennifer O’ Neal, an archivist and historian with the University of Oregon and a member of the Confederated Tribes of Grand Ronde, discussing the development of the Society of American Archivists’ adoption of the Protocols for Native American Archival Materials. Importantly, both Camille Callison and Jennifer O’Neal explained various traditional indigenous knowledge systems and possible ways to incorporate these systems into archival descriptions and learning for indigenous researchers. The experience was incredibly eye opening and left me with pages of notes and ideas to take back to this institution. The conference concluded with two non-indigenous archivists, Richard Pearce-Moses and Randall C. Jimerson, and their experience working with indigenous records and researchers. I learned the challenges they faced from other archivists trying to implement simple steps in an attempt to decolonize how we keep and classify indigenous records in a system that was created out of Western European ideology. In short, some conferences really do make a difference. I’m very thankful that I work for a board and director that sees the advantages of professional development and continues to support our staff in this capacity. I hope to continue to broaden my perspective and implement changes on how we approach indigenous archival material here at the Chilliwack Museum and Archives. Some steps are simple, some will require years of consultation and challenging changes. This conference was a great learning opportunity and I’ll use this platform to give a final shout-out to the Western Washington Archives and Records Management program for hosting an incredible event. 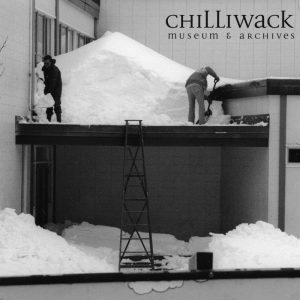 Perhaps you noticed that the Museum was closed this past Tuesday and Wednesday while Chilliwackians hunkered down during our most recent snow storm. If you have friends and family from nearly anywhere else in Canada, you’ve probably already heard every joke there is about how badly we handle snow in the Fraser Valley. Rest assured, Ontario is not the sole snowy province in Canada. If you are looking for some ammunition to defend your snow reputation, just ask some of the long-term locals about the truly great snow storm of 1996. Chilliwack Progress Press Photograph: Digging out a school, 31 December 1996. Christmas Day 1996 was a typical cold, but clear day. Those visiting their family in the Fraser Valley could not have known the storm that lay ahead. According to Environment Canada, 18 cm of snow fell in Chilliwack on December 26th followed by an addition 3.2 cm the following day. This precursor was just a warm up (or should I say snow base) for the real storm. Then, on December 28th, 42 cm of snow fell in town. Three-hundred and twenty people were forced to take shelter at Evergreen Hall alone. Unprepared, those seeking refuge in Evergreen had to sleep on the floor. The following day, another 39 cm of snow fell. Despite MLA John Van Dongen’s resistance, the Ministry of Transportation and Highways had no choice but to close the highway between Chilliwack and Abbotsford. By Sunday, December 29th, 982 people, 20 dogs, several cats, and one parakeet were seeking snow asylum at Evergreen Hall and the Hall was at full capacity. With the exception of Army trucks, vehicles were banned from driving. Nevertheless, Chilliwackians showed their true colours. Neighbours poured into Evergreen Hall and other shelter facilities to assist the City and the Salvation Army with cooking. Many of those seeking shelter were offered beds at nearby private residences. Archives volunteer Lawrie Edwards remembered opening up his house for a fellow BC Tel worker for three days. Local stores, including Fraser Valley Meats, donated food delivered by army trucks. Eventually the storm cleared and by December 31, Evergreen was once again empty for the holidays. 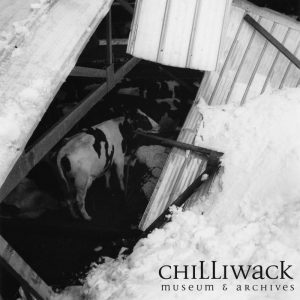 Chilliwack Progress Press Photo: Collapsed barn on Prairie Central Road, 31 December 1996. Despite the incredible strain on emergency services, not a single individual lost their life during the great snow storm of 1996. Nevertheless, Chilliwack still experienced its share of damage. Digging out the schools alone cost $15,000. At Vedder Middle School, a frozen fire main broke causing the gym to temporarily turn into an ice rink. Barns throughout the Fraser Valley collapsed and a lot of domesticated animals on nearby farms suffered. The following month The Chilliwack Progress received a plethora of letters from locals praising emergency responders. Commemorative survival certificates were sold for $2 with proceeds going to help fund the Chilliwack Search and Rescue and the Chilliwack Children’s Fund. While certainly challenged, no one can doubt that Chilliwackians stepped up when needed and overcame the great snow storm of 1996. Let’s hope next week doesn’t bring freezing rain or the next blog article will be about the great ice storms of 1917 and 1935. On New Year’s Day, the Chilliwack Progress predicted, “the year 1908 holds out great prospects for this little Valley… The expectations for this incoming year are great, the prospects greater, and the realizations will be the greatest of any.” For new immigrants and re-settlers to the area, 1908 was a pivotal year marked with major changes. The City of Chilliwack officially incorporated as a separate government entity from the Township of Chilliwhack. 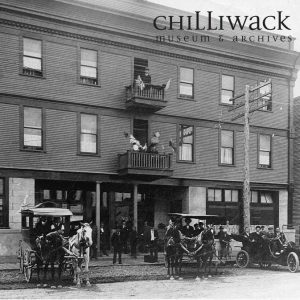 The first Empress Hotel in Chilliwack opened, the new City of Chilliwack installed the first electric lights in downtown, and just two years later the British Columbia Electric Railroad opened the first passenger and freight rail line to Chilliwack on October 3, 1910. As the City continued to expand that year, prominent local builder and architect Robert Harvey Brock began filling in the last vacant lot on the south side of Wellington Avenue between Main Street and Five Corners with the construction of the Royal Hotel. Although the Royal Hotel was well received, Dundas left the hotel business after just a few short years. He sold the building to Cyrus W. McGillivary in 1912 for $47,000. In 1926, Tom Berry bought the hotel from McGillivary. Tom Berry’s son, Harry “Buck” Berry took over from his father in 1947. The hotel was owned and operated by the Berry family until 1995 when Buck sold the building (CMA, AM 373 Tax Rolls). Large, colourful, and friendly owners, Tom and Buck Berry kept the hotel running through many renovations. The biggest change during the Berry years came in 1950 when Buck bought the Royal Bank building on the corner of Main and Wellington. 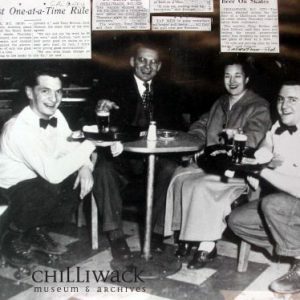 Corresponding with new liquor laws in Chilliwack that allowed hotels to sell beer by the glass, Buck Berry merged the hotel with the old Royal Bank building and built a beer parlor in the building he called, the House of Blues. To speed up service, staff wore roller skates as they rushed between the beer parlour and the kitchen, (CMA, Subject Files – Royal Hotel; CMA, 1999.065.002). The hotel saw its share of disasters as well. On July 29, 1958 lighting struck the Royal Hotel. Instantly, “a gaping hole was ripped in the top of the Royal Hotel. Seconds later the fire siren sounded and the city was alive with men, women, and children expecting the worst. It was a miracle nobody was killed.” An early response by the volunteer fire department saved the building. Buck repaired the damage and the business continued. Another fire damaged the hotel on August 9, 1974. This time the fire started near the entrance and worked its way to the beer parlour, destroying the inside of the bar. Undeterred, Buck again repaired the damage to the interior of the building. Perhaps knowing how much the Royal Hotel owed the volunteer fire crew, among the many charitable activities sponsored by the Royal Hotel, Buck Berry also hosted the volunteer fire department’s annual banquet in the beer parlour. Chilliwack Progress Press Photograph: The August 9, 1974 fire at the Royal Hotel, published August 14, 1974. In 1995, Buck Berry sold the hotel. The new owners began a massive renovation project beginning in May of 1996 and continuing through 1997 at the cost of $1,600,000 (CMA, Nicholas Desautels, 2016.023.001 file 7). All thirty-four rooms were redecorated and upgraded. Fourteen of the thirty-four rooms received special attention including, “restoration of wall-to-wall hardwood floors, an addition of a cast-iron claw foot tub to each room, and antique furniture in the form of chairs, wardrobes, and dressers” (CMA, Nicholas Desautels, 2016.023.001 file 7). The old boiler system was replaced with high efficient gas units, and renovations to the exterior of the building were completed as well, always with an eye towards the historic significance of the building. The Royal Hotel is not the oldest building in Chilliwack. It’s not the grandest building in Chilliwack either. 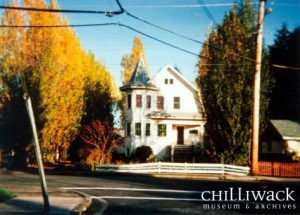 It is however, a fantastic representation of a unique time and place in the history of Five Corners and downtown Chilliwack. Should you have guests visiting and your spare bedroom is feeling a little cramped, encourage them to spend a night in one of the rooms at Chilliwack’s Royal Hotel. 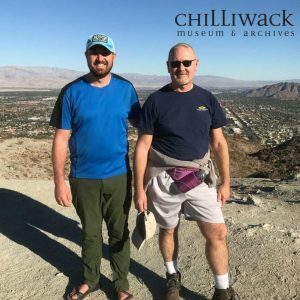 Last Movember I wrote a blog highlighting some of the individuals from Chilliwack’s historic past rocking a solid mo. The moustache is grown each November as a symbol of support to raise awareness for men’s health issues. This year, in addition to the typical male pattern balding, men’s health issues have particularly struck home for my family as we overcome some men’s health obstacles. For those of you still feeling intimidated about rocking a moustache in 2018, rest assured. Creativity is allowed and Movember is not limited to the standard stache. Let’s take a look at some of Chilliwack’s finer individuals that went beyond the moustache and donned some pretty elegant goatees during their life. Captain John Swalis from the Soowahlie First Nation lived on the Th’ewa:lí settlement on the North bank of SWEE-ehl-chah (Sweltzer) Creek. Like Chief K’hhalserten (Chief Sepass), Captain John Swalis lived during a challenging time of transition for his community and was widely respected both within his community and the growing re-settler community of the area. According to Denys Nelson, Fort Langley 1827-1927: A Century of Settlement, Captain John first came into contact with the growing re-settler community in 1858 when he successfully navigated the American steamship, the Surprise, from Fort Langely to Fort Hope, proving that the Fraser River was navigable by steamship (P. 24). Captain John was a resourceful builder and mover of goods. 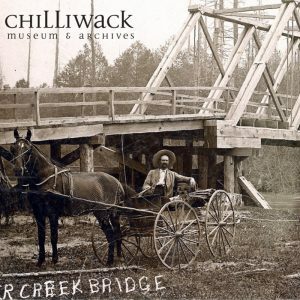 He was instrumental in the construction of the Alexandria suspension bridge, established a ferry service across Ts’elxwéyeqw (Chilliwack) River, and designed and built the first permanent bridge at Vedder Crossing with other members of the Soowahlie First Nation. Captain John helped construct the first church at Th’ewa:lí and vigorously advocated for his community. Captain John was a leader in the Soowahlie First Nation for approximately 40 years. He was born around 1810 and died December 9, 1908. Louis William Paisley was born July 1, 1860 at York, Ontario. 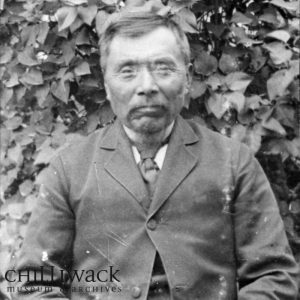 He farmed for a number of years at Whitechurch, Ontario before heading west in 1890, settling in Chilliwack. 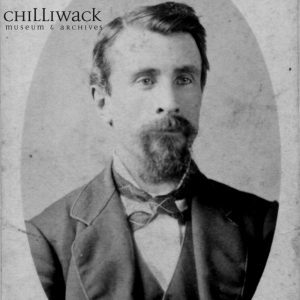 Described as a man of great energy, initiative, determination and good judgement, Paisley was an active promoter of Chilliwack. In addition to his involvement in real estate development and insurance with Samuel A. Cawley, he was also a highly successful auctioneer. He was involved with the local Masonic Order, the Independent Order of Odd Fellows, was president of the Agricultural Association, and secretary of the Dairymen’s and Livestock Association. He purchased and brought into the valley purebred live stock, which was the nucleus of the fine dairy herds for which the Valley is now so well-known. He suffered a massive stroke in 1910, and passed away on October 14, 1914 at the age of 55 years. Left to right, Tristan Evans and Greg Evans, Palm Springs, CA, December 2016. William Knight was born on July 24, 1851 in Horton Township, Renfrew County, Ontario. Knight moved west in 1870 to join the volunteers in the Riel Rebellion, then moved west in 1874 to the Cassiar gold fields. Knight purchased a small sawmill at Popkum in 1878, and continued in that business for 22 years. He married Mary Jane Jennie Kipp, eldest daughter of Isaac and Mary Ann (Nelmes) Kipp on April 23, 1883. William and Mary had eight children together, four daughters and four sons. Knight Peak is named in his honor. William Knight passed away January 15, 1928. Dr. Greg Evans, father of Chilliwack Museum and Archives, Archivist (me), knows how to sport a solid goatee when the season is right. Near the corner of Portage Avenue and Williams Street once stood a white and green three-story house. Built in 1909 by travelling salesman W. E. Bradwin, the house, built with clapboard siding and equipped with six-bedrooms, became the centre of local legend in the mid to late 1960s. Hetty Fredrickson moved into the house and resided in the house in the 1960s. 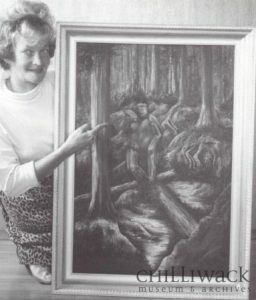 Known throughout the community for her artistic flair, she taught art to her students from the basement of the house and was the vice-president of the Upper Fraser Valley Brush and Palette Club. Once settled into her new house, she, along with her husband Douglas Fredrickson, began to notice something was amiss. In the dead of night, footsteps could be heard upstairs. Drawers could be found opened. Furniture, carefully arranged by the homeowners, moved out of place. In one instance, Hetty reported witnessing a light “in the shape of a human being, but with no details, no face.” (The Province, “Portrait of a Ghost” May 30, 1966) . Upon investigation, neither Hetty nor her husband could find the cause of such unusual activity and no logical explanation could be found by any who stopped by the house. And people did stop by the house. Using the unexplained occurrences as the basis for some of her art, Hetty painted a picture of the ghost in the hopes that by depicting it, that it would leave. The painting and her subsequent artistic pieces received widespread attention, spurred by stories of the occurrence in the house. Hundreds of people flocked to the downtown Chilliwack house, curious to catch a glimpse of the spirit at work. At one point, in 1966, Hetty Fredrickson submitted an application for a business license to City Council because she had “so many people wanting to see her ‘haunted house’ that she might as well charge admission.” (The Chilliwack Progress, July 20, 1966). While the application was ultimately rejected, it was reported that 700 people showed up one Sunday for a tour of the premises! Following the Fredrickson’s move to Vancouver Island, odd occurrences continued to plague residents of the house. Tenants reported seeing shadows moving back and forth, doors banging closed and scaring pets living at the house, unexplained changes to the House’s thermostat… New theories about the ghost began to emerge to explain the wide plethora of baffling activities at the House. Was the house settling a contributing factor? Were residents imagining things? Perhaps it was more than one ghost? An anonymous resident speculated it could be a ghostly trio haunted the turreted house. In the years after the departure of the Fredrickson’s, the Bradwin house caught fire twice. The first fire in 1972 was attributed to an overheated fireplace. The second fire in 1975 destroyed the House. A new house has been built in its place and, as far as we at the museum are aware, no unexplained incidents have happened since. The idea of repairing something can oftentimes take a backseat to purchasing a new item. Stores lined with new, shiny gadgets and niceties designed to make our lives easier often win out over rolling up our sleeves and fixing what we already own. These Boots Were Made For Walking? Buying new items when a problem occurs with an older object hasn’t always been the first instinct. Got a shoe separating from its sole? Today, we might head to Wellington Avenue, to one of the malls or look for a new pair online to see if something that might catch our eye. In the late 19th century and throughout the 20th century, however, purchasing a new pair of shoes was often a considerable investment for families, especially families with young children. Visiting a local cobbler or shoe store offering repair services, such as E.O. Wickham’s or A.E. Wiltshire Shoe Repair, could often extend the life of a pair of shoes, sometimes for decades depending on the level of care and maintenance paid to a pair of shoes and the material composition of the shoe. Re-soling or adding soles to shoes was (and continues to be, although much less common) one way of making shoes last longer. 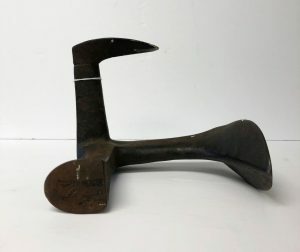 Sole and heel menders, such as the ones found in a Shoe Repair Kit donated to the Chilliwack Museum and Archives, could be attached to the underside of the shoe and were typically affixed with nails. While driving nails into ones shoes may no longer be common outside of the cobbling profession, modern adhesives such as Shoe Goo allow for young and old alike to fully re-tread well-worn footwear, re-attach separating soles and fill holes at their convenience without use of a hammer or specialized tools. Shoe lasts were and continue to play a key role in the manufacture and repair of footwear. Traditionally made from wood or metal, shoe lasts are foot-shaped inserts used by cobblers to form and fill-out shoes while not being worn by a person. Shoe lasts come in a wide variety of shapes and sizes to accommodate the different styles of feet and the different types of shoes people wear. They can be used as a base around which to craft a shoe or as a form to hold the shoe’s shape whilst being repaired. 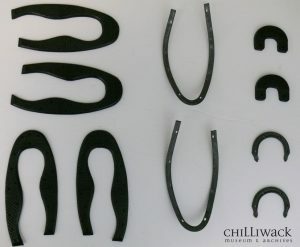 Shoe lasts are different than shoe trees or shoe stretchers, which are used more frequently to hold or expand the shoe’s shape when not being worn. 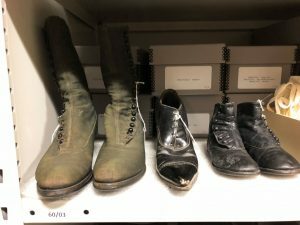 At the Chilliwack Museum and Archives, we are proud to house a variety of artifacts that have been donated by the community, including examples of historic footwear and tools used to make and mend shoes and boots of all shapes and sizes. To donate to our object collection, please feel free to contact me by email at [email protected] or by phone at 604-795-5210 ext. 105. One of my favourite features of Chilliwack is the large variety of produce stands in this city. Whether you prefer large produce shops where you can buy all your fruits and vegetables such as Hofstede’s, Garrison Gourmet Greens, and Produce Gone Wild or you prefer seasonal drive-thru fruit stands, Chilliwack has them all. With Chilliwack’s rich agricultural history, it may not surprise you to know that produce stands are not a new phenomenon. The Kipp family used to sell boxes of plums from a small makeshift table in front of their house as early as the 1880s. Many long time residents of Chilliwack may remember the Carter Family Fruit Stand on the Haas Hop Yard at Evans Road or Woo Farms Potato Drive-in at Chilliwack’s South Chinatown. The most iconic produce stand in Chilliwack’s history might just be Christie’s Produce Stand. James Christie and Caroline Runzer married in 1925 at the age of 38 and 25 respectively. The relatively new immigrants to Canada opened a restaurant in Stony Plain, Alberta. In 1935 a devastating fire destroyed their restaurant so the couple packed up shop and moved to Chilliwack. They purchased land on Yale Road West just south of Cheam Avenue near the gates of the City for $600. 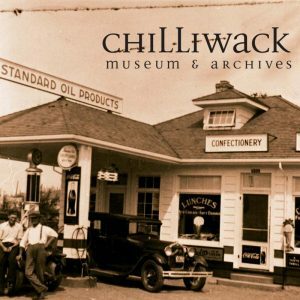 Upon arrival in Chilliwack, James immediately built a Standard Oil gas station that contained the living quarters for the family and a small lunch counter. The gas station was sold in 1939. A newer Chevron station still operates at the same location as Christie’s gas station. In a 2005 interview with the Chilliwack Progress, James and Caroline’s daughter Audrey Neufeld recalled how, “dad was quite an entrepreneur, he had all kinds of ideas, and he did it all right here.” After selling the Standard Oil station, James and Caroline Christie built a new home to house their growing family just south of the gas station. In front of the new house James built a small produce stand that also sold honey, ice cream, dill pickles, and hotdogs. Just north of his produce stand James built a number of small commercial buildings that he leased out. The hotdogs were served with a special relish made by Caroline. She sourced her ingredients for the relish from her own garden. 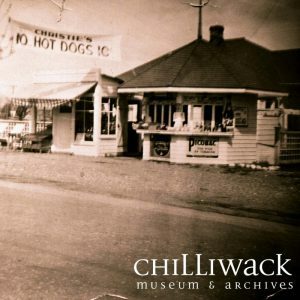 Mrs. Caroline Christie’s famous hotdog relish recipe is available in a book, Chilliwack Pioneer Recipes. Christie’s Hot Dog stand operated throughout the 1940s. The family stopped selling hotdogs in the 1950s but kept Christie’s Farm Fresh Products open selling produce, honey, homemade dill pickles, candies, ice cream, tobacco, and camping supplies. James and Caroline even began raising and selling chickens. According to research by Sharon Lawrence, the family had 5000 chickens that were slaughtered, cleaned, and cooked. They were used for lunch plates which consisted of half a cooked breaded chicken, homemade pickles, and homemade bun all for the price of $1. As the autumn colours come into full swing, I am reminded to stop by the produce stands and pick up a bag of apples. Whether you prefer making apple pie or drying your apples for an outdoor adventure snack, make sure to support your local Chilliwack produce stand. Disclaimer: Much of the material for this blog post comes from research by Sharon Lawrence and an interview from Audrey Neufeld conducted by Sharon Lawrence. Have you seen the For Sale sign at the Progress’ Spadina Avenue office of late? Will it be redeveloped or remain as commercial property? How will it impact the downtown core and commercial presence in the neighbourhood? Similar to other notable buildings going on the market around town, it made me recount the impact of these structures and subsequently what the change on the landscape will mean. I immediately began researching the impact of our community newspaper and the history of the building itself. Until post-war suburbia raced in and changed our downtown, the ‘heart’ of our community, it was thriving and bustling. Not that this blog post is about our downtown specifically, but it is about identity and place. Having a place to identify as the ‘heart’ of a community could have been easier for Chilliwack residents before the strong influence of the vehicle and subsequent development of the shopping mall. Five Corners (previously known as “Centreville”) was a nucleus of commercial and social interaction and a short walk from many residential homes. 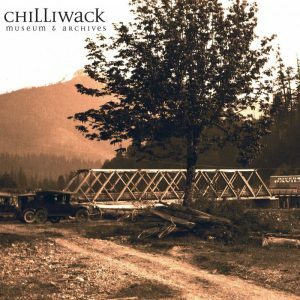 The Chilliwack Progress office has (whether it sought out to or not) shaped identity and place, in and for our community since the late 1800’s. 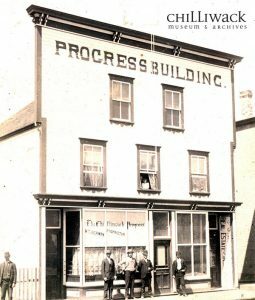 The first Chilliwack Progress building dates back to the 1890’s. William Thomas (W.T) Jackman purchased a printing and newspaper press in Toronto and shipped it to Chilliwack where he published the first edition of the Chilliwack Progress in April 1891 at 39 Yale Road East (now 46169 Yale Road East). 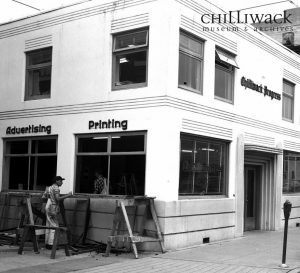 The Chilliwack Progress office was a three storey structure with glass front main floor and wooden sidewalk. 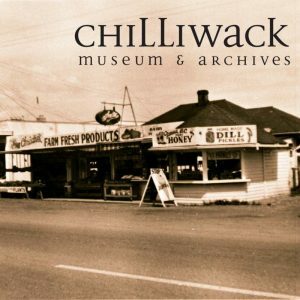 Situated amongst some of the most frequented buildings in the downtown, The Chilliwack Progress was a thriving hub of information, activity and culture. It shared real estate with the likes of the Commercial Hotel, a shoe store, On Lee laundry, the post office, a bakery, hardware store and drug store. Investigating a bit further into this building I found that the Progress remained at this address for 83 years! Over time the building had a few face lifts, notably in the 30’s with a very stylish post- modern look. What I find fascinating is that the Chilliwack Progress was the ‘heart and soul’ of our community. For those that had lost something, wanted to gain a roommate or sell something, where did they go? The Progress! If you had donations of food or money that you wanted to give to a local charity, where could you drop such items off at? The Progress! Colouring a poster contest and want to drop off your submission, where should you go? The Progress! 1955- Please return these keepsake pearls to the Progress office. A 1918 rental advertisement for a farm. Where should one apply? The Chilliwack Progress office. An advertisement in the Chilliwack Progress, 26 June 1974 [https://theprogress.newspapers.com/image/77088771], invited the community to an open house for their new building on the corner of Hope and Spadina – its current location. It boasted new “ultra-modern premises” that ranked with the “best in Canada”. They cordially invited the community into their new facility for a behind the scenes tour as well as coffee and refreshments. This sort of courtesy and openness is a product of the culture that was created over decades and through the words, attributes and action of all the contributors, writers and editors of our local paper. Reading through old editions, I believe the sense of place persisted with the change in location. But has being further from the downtown core changed the identity or heart? As technology has shifted to a strong internet presence, the Chilliwack Progress has followed suit. How has this technological change impacted the effect the Chilliwack Progress has on our community? How do people today identify in our community? Is there a disconnect between sense of place and the presence of ‘being’ online? Interaction has a strong internet base and I struggle to deem this as ‘socializing’ nor does it have the same effect or impact in the community that the Progress had many years ago. To be in the heart of a community, delivering an assortment of news and being a hub of activity and information is a great challenge and honour. I am hard pressed to find a current example of such a place that could offer what the Progress did. A local coffee shop? Local library? Museum, perhaps? I hope that the new home of the Chilliwack Progress offers an open door to the community, ensuring identity and a strong sense of place continues. Painting of 1891 bridge by Carolyn Louise Wilson. When done correctly, interpretive signage has the ability to be a great public history tool. If done incorrectly, interpretive signage may not only be offensive, it can misinform the pubic on the history of an event, location, or historic site. Careful consideration on what an individual or organization chooses to portray or omit on an interpretive sign is imperative. By deciding what and how a historical event is told, interpretive signs often represent more the values of the society creating the signage than the historical event itself. To put it simply, a good and lasting historic interpretive sign is hard to do. So hard that the Yukon Department of Tourism has a 65 page Interpretive Signage Strategy! With this in mind, early last summer I was contacted by City of Chilliwack staff who asked if I could help unearth some information for a new interpretive panel going up at Vedder Crossing. Although challenging, I’m a big believer in public history and I believe when done with consideration, interpretative panels are a fantastic resource for the public. 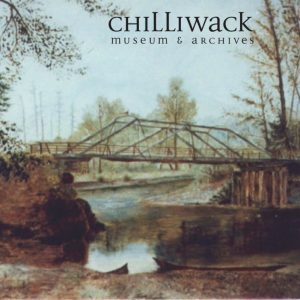 In addition to contacting the Chilliwack Museum and Archives, the City also contacted and consulted with the Stó:lō Research and Resource Management Centre, other several City of Chilliwack staff members, and many other unnamed community members. Throughout the summer and into the fall City staff researched, organized and collected our research, looked up and consulted on facts and spelling, asked for more research, consulted more, drafted a couple versions, did more research and consulting, and finally together with the design team came up with the final draft for the new interpretive bridge panel at Vedder Crossing. This collaborative effort with the City of Chilliwack, Stó:lō Research and Resource Management Centre, and the Chilliwack Museum and Archives finally came together and the City produced the first in a series of interpretive signage at Vedder Crossing. This panel has since been installed at Vedder Crossing. It briefly touches on the history of the river and then goes on in greater detail to discuss the nine “permanent” bridges that have been built at this location. While this first panel focuses on the history of the bridges, future panels will touch on the history of the Ts’elxwéyeqw (Chilliwack) River, the Vedder name and family, biology and fish species, and perhaps more. Next time you go for a walk by the river at Vedder Crossing I hope you stop by the interpretive panel and take a moment to read about the challenges of constructing a lasting bridge in this location. With intense fires gripping the west coast, fire safety is at the forefront of people’s minds. In Chilliwack today, we are fortunate to have 6 fire halls located throughout the City, staffed with firefighters, career and on-call alike, along with numerous volunteer fire departments stationed in more rural locations. While the bravery and determination of these men and women has remained constant over time, the vehicles used to fight fires in Chilliwack have changed substantially. 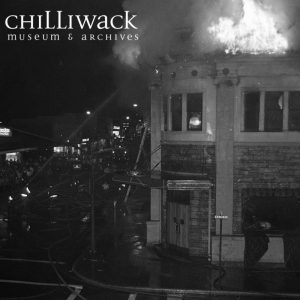 Based out of the blacksmith’s shop on Main Street owned by Chilliwack’s first Fire Chief, Thomas Knight Jr., the first brigade was formed shortly after the Wellington Street Fire in 1906. The original brigade was comprised of 27 volunteers who, in the event of a fire, were summoned to duty by sounding the church bell located at Cooke’s Presbyterian Church. The first piece of equipment purchased by the newly founded brigade was a hand-drawn hose reel. Bought for the tidy sum of $100.00 from the City of Kamloops in 1906 (accounting for inflation, this amounts to more than $2,176 today), the hose reel was mounted on two large wooden spoke wheels and required four individuals to move. Once the hose reel was in place near the fire, the hose would be unwound and a nearby water source would be located to extinguish the fire. The hand-drawn fire hose cart, still in existence today, is proudly on display by the Chilliwack Fire Department at Chilliwack Fire Hall No. 1. At the Chilliwack Museum and Archives, we are fortunate to have a small fragment of the original hose cart in our collection. The portion of wood water pipe, reinforced with wire, formed part of the unit’s central drum. It was removed in 2006 during the restoration of the hose cart. To supplement the hand-drawn hose reel, the brigade also invested in a horse-drawn hose and ladder wagon that same year. While at least two wagons were considered for purchase, the wagon offered by the City of Vancouver was acquired for $100.00. As the name infers, the horse-drawn hose and ladder wagon, unlike the hose reel, relied on the use of horses to be transported to and from fires. 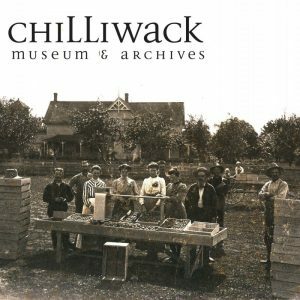 Chilliwack Fire Department 1906-2006: The First 100 mentions that Chilliwack firefighters regularly jockeyed for the opportunity to have their teams of horses pull the wagon. Upon hearing the fire bell, firefighters raced to see who could arrive with their horse teams at the wagon first. Winning the informal competition provided not only a sense of civic pride for local firefighters, but also came with a small sum for temporary use of the horses. As time wore on and technology advanced, both the hand-drawn hose reel and the horse-drawn hose and ladder wagon were replaced with modern vehicles. With mass production of automobiles coming into its own in the early 20th century, the fire brigade bought its first motorized fire truck, a Ford Model-T, in 1925. Other examples of fire trucks soon followed suit within various fire halls throughout the community, including a volunteer-built fire truck for the Rosedale Fire Department in 1948.